A town crier and a parade of Lord Mayors, Mayors and other Civic Heads from across Yorkshire make their way through Halifax during the Yorkshire Day Celebrations. GOD’S own County celebrated 1,141 years in inimitable style today - with everything from welly-wanging to a giant bouquet of white roses. Halifax put on the biggest show for this year’s glorification of all things Yorkshire with Mayors from Hull to Huddersfield and from Richmond to Rotherham parading in full regalia through the town. Tom Pearcy from the York Maze before the start of the Yorkshire Pudding tossing compitition. Large crowds turned out to see the spectacle, while shops and businesses decorated their premises with white roses. “Yorkshire is rich in capital - human, natural and social - and would benefit from more freedom being given to its regional leaders to shape its own future within the UK. Leader of Calderdale Council Coun Tim Swift, said: “We were privileged to welcome around 200 dignitaries from every corner of Yorkshire and see so many people lining the streets of Halifax and waving their Yorkshire flags. The symbol of the county was unsurprisingly a key theme of the day, with the White Rose Shopping Centre celebrating its namesake by creating the UK’s largest ever bouquet of white roses. Over 2,000 roses were assembled into an 8ft tall arrangement, with shoppers invited to use a floral selfie frame to take a perfectly framed shot. Yorkshire Day was a source of civic pride. Social media followers of Sheffield-based broadband company Plusnet chose it as an emoji to represent the county, over alternatives including a Yorkshire terrier, flat cap, and a teapot in a cosy. Meanwhile RHS Harlow Carr marked the occasion with a welly-wanging contest - a sport that orginated in Upperthong, Holmfirth - while passengers jetting away from Leeds Bradford Airport with Jet2.com were given a proper Yorkshire Day send off, with the Otley Brass Band playing classics, including a rousing rendition of ‘On Ilkley Moor Baht’at’. One of the key features of Yorkshire Day is the reading of the Yorkshire Declaration of Integrity. Always read in York, this year’s declaration referred to “within these boundaries of 1,141 years standing”, a reference to its Viking foundation in 875AD. Former Bishop of Liverpool, the Right Rev James Jones, who is now the adviser to the Home Secretary on Hillsborough, reminded listeners to Radio 4’s Today programme that just week ago a study of DNA showed Yorkshire was the most British region in the UK with over 40 per cent having Anglo-Saxon ancestry. Rev Jones told The Yorkshire Post: “With so much responsibility given to Scotland and Wales to run their own affairs there’s an ever stronger case for Yorkshire to have more control over its economy, environment, transport and health and social care. People lined the streets of Halifax this morning to watch the main event of this year’s Yorkshire Day celebrations. Around 200 mayors and dignitaries in full regalia travelled from across the county to march from Halifax Town Hall to Halifax Minster for a Yorkshire-themed service. Mayor of Calderdale Howard Blagbrough led the parade alongside Ossett’s LA Jazz Band and a brass ensemble, while businesses throughout the town centre were decked out with white rose bunting. The band performed Dixieland style jazz re-workings of Yorkshire themed songs such as On Ilkley Moor Baht’at. This year’s festivities mark the first time since 2003 that Calderdale has played host to Yorkshire Day’s main celebration. At Halifax Minster, reflective readings on God’s Own County were bookended by drum and choir performances. Representatives from numerous faith groups delivered readings on the warmth of the county while tribute was paid to Yorkshire grit in the wake of the Boxing Day floods as the end of last year and the county’s unity following the killing of Batley and Spen MP Jo Cox in June. Addressing crowds at the opening of the parade, Halifax town crier Les Cutts said: “We are honoured to host the Yorkshire Day celebrations. Yorkshire has the best architecture, it has the best countryside, it has the best water, the best tea and the best Yorkshire puddings. Calderdale’s libraries and museums hosted exhibitions and craft workshops over the weekend to mark the occasion. Today’s parade passed through Crossley Street, Princess Street, Horton Street, Square Road and Church Street before reaching the minster. Dignitaries then attended a Yorkshire Day lunch at the MBi Shay Stadium with Angela Knowles, the original Calendar Girl, as the guest speaker. Calderdale Council flew the Yorkshire flag at Halifax Town Hall from sunrise to sunset. 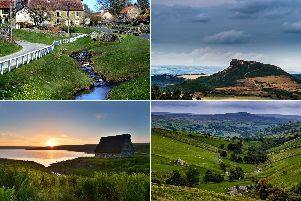 The lyrics to Yorkshire’s unofficial national anthem On Ilkla Moor Baht ‘at were reputedly written by members of a Halifax church choir on an outing to the famous spot. Yorkshire Day was first celebrated by the Yorkshire Ridings Society on August 1 1975. The society was formed a year earlier to campaign for the traditional boundaries of Yorkshire which were substantially altered by a radical mid-1970s local government reorganisation. According to the society, August 1 was chosen as it is the date of the Battle of Minden, in Germany, in 1759. The battle is marked by the Army by allowing soldiers to wear roses in their caps and Yorkshire regiments have traditionally sported the white rose. One of the key features of the day is the reading of the Yorkshire Declaration of Integrity. Yorkshire Day straw bale races at York Maze. Yorkshire Day welly wanging at Harlow Carr Gardens, Harrogate.